Another weakness of mine is really good massage products. I like oils that are easily absorbed into the skin and not greasy. I really like Lush's range when it comes to massage bars they have all different shapes, sizes, and scents. My two favorite ones however are Strawberry Feels Forever and Each Peach (and Two's a Pair). Not only are these great massage products they are also good for moisturizing after a shower to make your skin feel silky soft. A little goes a long way with these bars too, I find if I use too much I run out of skin to spread it all out on. I also like that dusting powders are optional with these and they do not stain sheets or clothing with color or oiliness. My only hang up about these is they melt right at body temperature so they melt rather easy even just sitting in your hand so they can be really messy because of their low melt point. Don't leave these anywhere near direct sunlight either or you'll have a pool of massage bar to come home to. Strawberry Feels Forever: This is such a sweet little bar, it reminds me of those strawberry parfaits my aunt would make when I was a kid with that sweet strawberry gel and tons of whip cream. I like this one because not only is it a sweet scent its also really fresh smelling and not overpowering. It works great as a moisturizer after the shower and keeps your skin soft all day. 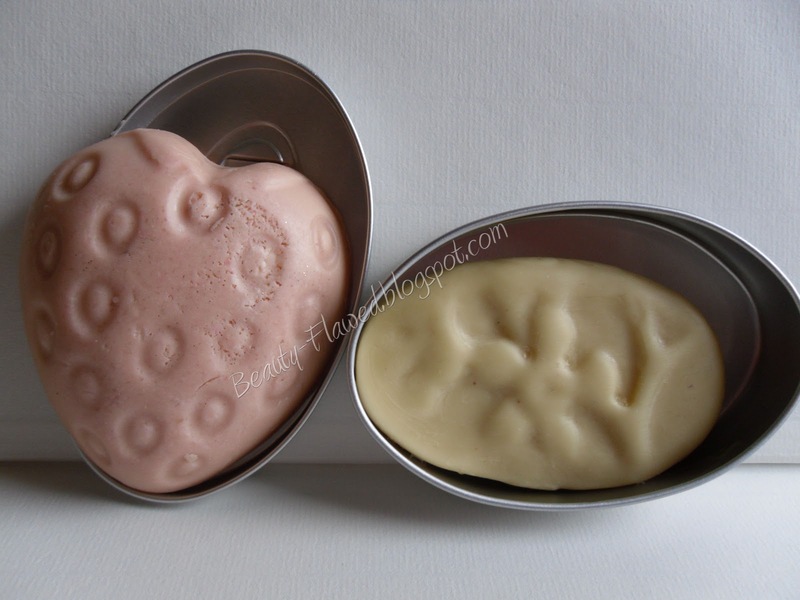 Ingredients: Cocoa Butter (Theobroma cacao), Shea Butter (Butyrospermum parkii), Perfume, Coconut Oil (Cocos nucifera), Fresh Strawberries (Fragaria vesca), Glycerine, Olibanum Oil (Boswella Carterii), Bergamot Oil (Citrus Aurantium bergamia), Geranium Oil (Pelargonium graveolens), Hibiscus Flower (Hibiscus sabdariffa), *Limonene, *Linalool, D&C Red 30. Each Peach (and Two's a Pair): This is by far my FAVORITE massage bar that Lush makes. Now the name is really deceiving because well it doesn't smell like a Peach, this little guy is more of a citrus scent. For me it smells just like Lemon Pez Candy and let me tell you I LOVE Pez candy. So this was a win win for me. The one pictured I have used a few times (sorry I couldn't resist), I love putting it on after a shower because the scent lasts all day and there's no need to wear perfume if I have it on. This is also a very moisturizing product and leaves your skin silky all day. Ingredients: Fair Trade Cocoa Butter (Theobroma cacao), Shea Butter (Butyrospermum parkii), Perfume, Avocado Butter (Persea gratissima), Mango Kernel Butter (Mangifera indica), Lime Oil (Citrus aurantifolia), Sweet Orange Oil (Citrus dulcis), Mandarin Oil (Citrus nobilis), Grapefruit Oil (Citrus grandis), Safflower Flower (Carthamus Tinctorius), *Citral, *Geraniol, *Citronellol, *Limonene, *Linalool. Both of these are available on the Lush website or in Lush stores for $9.95. They are a great price and they really last which is a great bang for your buck. I'll continue to buy these especially Each Peach (and Two's a Pair) because its lemon pez scent has me hooked! If your looking for something a little outside the box for massage or even as an out of the shower moisturizer these are great products and you should give them a try! It is super nice I have heard rumors that its being discontinued hope they are not true!